Our popular women’s networking event, Forever Manchester Women, returns on Wednesday 19th April at Slater and Gordon’s offices. So far the Forever Manchester Women events have raised over £13,000 to support female-led community activity across Greater Manchester. This instalment of the event is kindly sponsored by local law firm Slater and Gordon, and will be hosted at their incredible event space in their offices in Manchester. Jennifer Atkinson is our business speaker for the evening. Jennifer joined ITC Luxury Travel as Head of Marketing in 2004 and has had an interesting journey during her time there. She is passionate about travel and this transposes in to her everyday worklife. She has seen a fantastic growth and development of the company during her time at ITC culminating in seeing the company through the recession and in January 2009 she was appointed Chief Operating Officer and the following year appointed Chief Executive Officer. Jennifer has enjoyed seeing the success of the company grow to delivering a £75m turnover. You may have seen Jennifer in the BBC2 documentary Millionaire’s Holiday Club in 2016 which was a behind the scenes look at luxury travel and was based around the work of ITC and its staff. What attracted you to Forever Manchester and Forever Manchester Women? I love the ‘can do’ energy of Forever Manchester, and the positive influence you guys have on communities across the city. 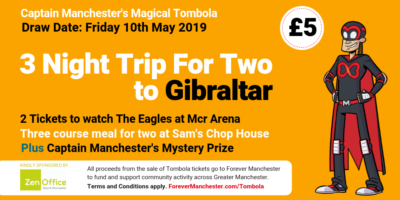 As a native northerner and long-time Manchester resident, I’m so glad that the ITC Travel Group, and I personally, can contribute in some small ways to supporting this great local charity. Of course, as one of few female CEOs in her early forties in the North West, and someone who will always champion women in business, I feel especially connected with the goals and positivity of FM Women! I live in Didsbury, and I love the ‘village’ feel it has. You can stroll to shops and cafes and there are plenty of parks with great playgrounds for my kids. More generally, I love that Manchester has a growing reputation on the world stage as (dare I say) the centre of the Northern Powerhouse! All of the business innovation, arts and culture makes it a really exciting city to live in. I’m glad my children get to grow up here and have access to so many different activities and spaces. What’s one thing you’ve struggled with/has surprised you/you’ve enjoyed the most along your journey with ITC Luxury Travel? I think balancing a career and raising a family is the biggest challenge that any woman faces. All I know is that there is no perfect formula – sometimes I feel like I’m doing a great job and at other times it feels like nothing’s going quite to plan. I’m proud to be an example to other women with young families: it shouldn’t be a barrier to success. But I also find it important to be honest about the struggles that come along with these things, otherwise you end making others feel inadequate and that’s something I’d never want. What’s strong and good in your community at the moment? I do wish that I got to spend more time enjoying the strength of my local community. As a CEO and mum of two children under 4 years old I must admit I’m not as involved as I like to be! One thing that always strikes me about Didsbury, though, is the amount of local independent businesses that continue to thrive. There aren’t many high streets left where butchers, grocers, fishmongers and even independent cheese shops thrive alongside big high street names. I really admire and relate to the hours, effort and passion that local business people put into keeping these fantastic community assets going! Tickets are just £20, which includes a welcome drink and canapés. All proceeds from this event will go towards supporting community activity across Greater Manchester.